Henry Winkler's character, Arthur Fonzarelli (more often called The Fonz or Fonzie), is known the world over as the King of Cool. Whether you grew up watching Happy Days or just caught a rerun or two, everyone has seen Fonzie give his trademark thumbs up and "Aaaaeeeyyy" greeting. Most of you have probably tried it yourself. With his classic black leather motorcycle jacket, white t-shirt, jeans and boots, Fonzie made motorcycles cool and inspired a generation of future bikers. If you go all the way back to Season One of the show, Happy Days was filmed outdoors on location, not in the studio like it was for the remaining nine seasons. 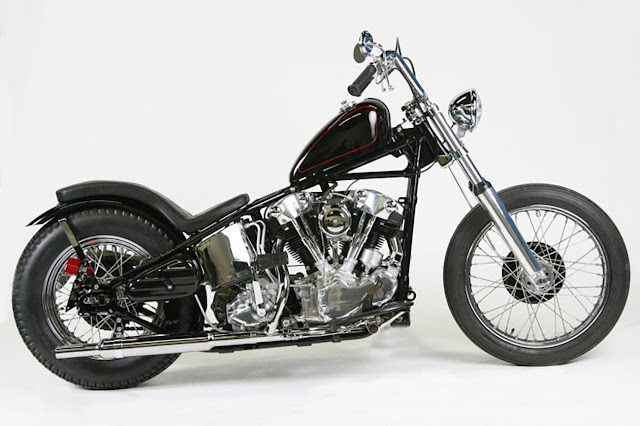 During this first year, Fonzie was not riding a silver Triumph, but a 1947 Knucklehead Bobber. 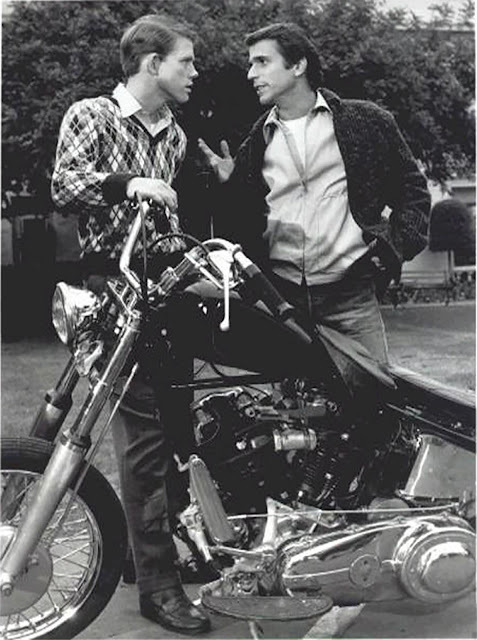 The motorcycle wrangler for Season One was Chris Haynes, and he had this to say about The Fonz: "I spent time trying to teach Henry Winkler how to ride it but he was scared to death of it. In the scenes when Henry pulled into frame with it running I was the guy who started it and got it pointed in the right direction." 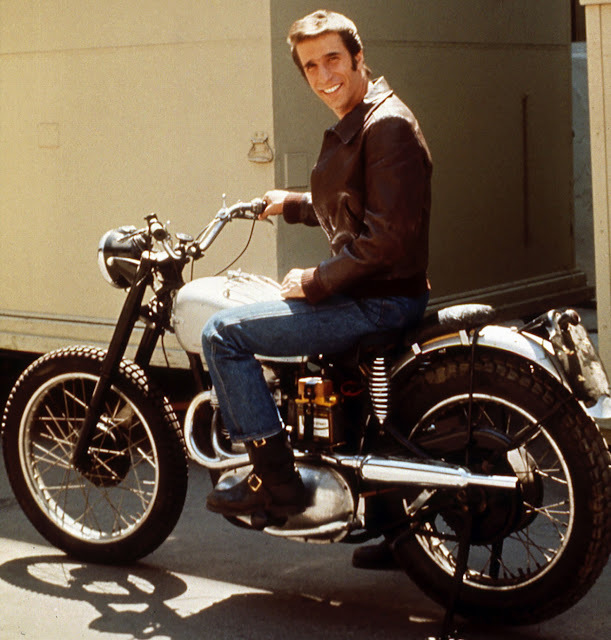 Turns out that Fonzie may have been the King of Cool, but Henry Winkler actually suffered from dyslexia and could never master riding a real motorcycle. By Season Two, the budget for the show had been reduced, along with some of the staff including Chris Haynes. No one else on set could start the Knucklehead, so it was traded for a smaller motorcycle which was easier for Winkler to push around. 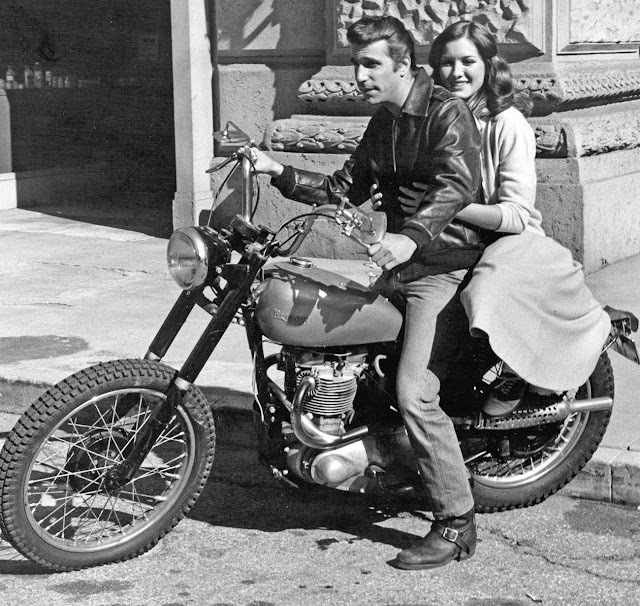 That motorcycle was the silver Triumph which most people associate with Fonzie. Built by Bud Ekins, a famous offroad racer and stuntman, the Triumph lasted all the way until Season 8. Along with the switch to the smaller motorcycle, Fonzie also traded in his windbreaker for his iconic leather jacket. 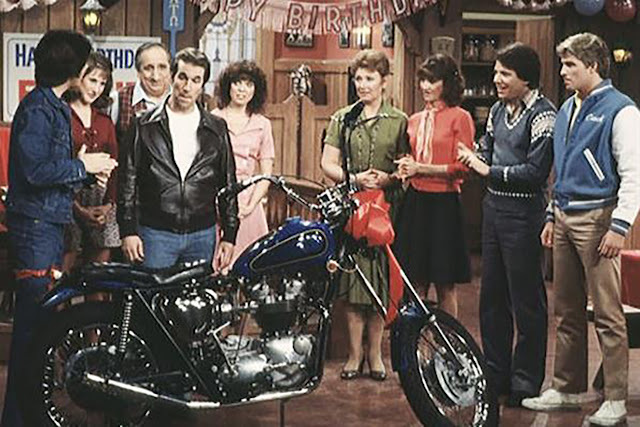 He now had the "look", but even with the easier to handle Triumph, Winkler admits that he never rode it or any of the other motorcycles throughout the ten years that Happy Days was on the air. For the rare scenes where Fonzie was seen riding, the crew sometimes had to go as far as mounting the motorcycle onto a board with wheels attached, so it could be pulled across the set. Otherwise Fonzie just coasted through the scenes. It also seems that more than one silver Triumph was used in the show. Compare the two Triumphs pictured above and you'll find a variety of differences between the them. At least one more Triumph made it onto the show for the last two seasons. This one was given to Fonzie as a gift after the silver Triumph was wrecked.